A pensioner was yesterday released on $200,000 bail on a charge of causing death by dangerous driving. 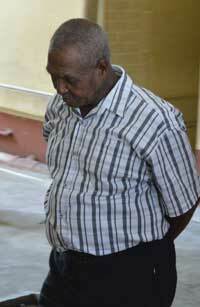 John Haynes, 77, a taxi driver of 102 Second Street, Alexander Village, Georgetown, appeared before Chief Magistrate Ann McLennan in the Georgetown Magistrates’ Courts where he denied the charge which alleged that on February 10 at Brickdam, Georgetown, he drove motor car HC 184, in a manner dangerous to the public, causing the death of Morris Jeffrey. The man was represented by attorney-at-law Adrian Thompson who asked that bail be granted to his client. The lawyer told the court that on the day in question his client was dropping off a passenger when Jeffrey, who was a vagrant, ran over the road and ended up in his client’s path, which caused him to be struck down. Police Prosecutor Gordon Mansfield had no objection to bail being granted to the defendant, but asked that conditions be attached. The Chief Magistrate granted bail to the tune of $200,000. Condition of the bail is that he report every Friday to the Brickdam Police Station until the completion of the trial. He was instructed to make his next court appearance on February 28 for statements.